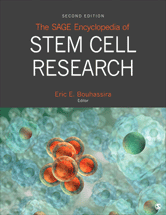 The SAGE Encyclopedia of Stem Cell Research, Second Edition is filled with new procedures and exciting medical breakthroughs, including executive orders from the Obama administration reversing barriers to research imposed under the Bush administration, court rulings impacting NIH funding of research based on human embryonic stem cells, edicts by the Papacy and other religious leaders, and the first success in cloning human stem cells. This second edition reference work will serve as a universal resource for all public and academic libraries. It is an excellent foundation for anyone who is interested in the subject area of stem cell biology.